snowdeal.org > ex machina: the eric update - day 1826: visiting the kitchitikipi ( the big spring ). the eric update - day 1826: visiting the kitchitikipi ( the big spring ). whoohoo! 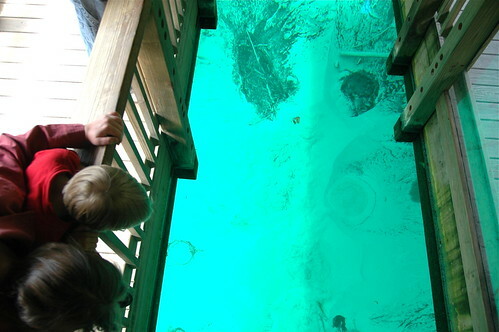 we can now cross of visiting michigan's largest natural freshwater spring from The List of Things To Do. kitchitikipi means "big cold water" and the name is appropriate; the 300 feet by 175 feet by 40 feet deep lake is fed by a spring that flows at the rate of 10,000 gallons per minute at a constant 45 °F throughout the year. if you look through the open bottom of the observation raft you can clearly see the sand on the bottom ever shifting as the emerald spring water is forced up through the bottom by hydraulic pressures created by the surrounding geography. it's certainly not something you see every day, but i'm not sure it's worth going too far out of your way to visit. though, if you're near manistique, check it out. oh, and bring the "bug dope". the skeeters will eat you alive.